Come one, come all and see something spectacular that will leave you in awe! That’s exactly what we felt when we got something dreamy and fantastic in our inbox. For today’s fabulous fete, we can’t wait to share this carnival-inspired theme made with a lovable twist! Li’l Jillianne, in fact, celebrated her first year milestone with a revelry that shook our hearts and made us squeal with girlish delight. 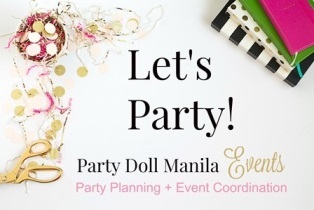 Thanks to the amazing sleight of hand of Aileen Abadilla and her merry team at Pretty Little Party, everything was eye-poppin’ pastel perfection! So grab some popcorn and hold on to your cotton candy for a carnival of a lifetime! Step inside and be amazed as the ceiling was bedecked in swags of light hues for a bright, playful feel that mimicked a circus tent. Japanese lanterns and paper balls in fresh colors of pink, purple, and baby blue filled the overhead as well—a lovely addition that we totally agree on! Take a step back and we promise you, the stage is simply magnifique! Balloons in cotton candy hues of purple, pink, peach, and mint had our heads up in the clouds! Spot the charming clown that totally erased our fears of this li’l guy! And did we mention how gorgeous the flower boxes flanked the birthday cake? What a darling display! True to the theme, layered ruffles in pastels made for lovely table skirts. Each table had an adorable toy Ferris wheel set beside a dainty-looking clown. Some were bedecked in tiny, pastel balloons, while others had a vase of lavender sprigs—completing the dreamy setup. Of course, kids had their own special spot as well. They had front row seats to the fun and festivities, and also get to have their own adorable, fancy hats! Some were given magician’s hats and long capes to don, while others got to wear tiny caps and pretty capes with ribbon fastenings. We’re absolutely smitten with how endearing li’l Jillianne’s cake was! Done in pretty pastels, the two-tiered confection from Crafty Cakes and Cupcakes was made to look like a carnival tent atop a marquee. Zoom in closer and that darling clown totally stole the show! Cake pops, sugar cookies, and cupcakes were quite the masterpiece in their pastel glory. Frankly speaking, they were all too pretty to gobble up in one bite! Guests were able to pick from any of the snack carts set up before feasting began. Kids and adults get to enjoy swirls of fluffy cotton candy and scoops of delectable ice cream with luscious toppings. Glasses of palamig quenched everyone’s thirst after the fun and games. Just like in the carnival, there are fun games for kids and kids-at-heart to join in! An amazing magic show had kids ooh-ing and ahh-ing, while a comical puppet show had everyone up in stitches! Never a dull moment at the birthday bash as guests happily participated in the fun. We’ll never know what’s inside the loot bags but we’re pretty sure these were filled with everything good. Game winners get to bring home fancy knickknacks and toys as prizes. Here’s a beautiful family portrait of young Jillianne with her proud, happy parents. We know how grateful they were for everyone who took the time to celebrate their li’l gal’s first-year milestone. Cheers to the suppliers who made this fantastic fete come true!